Remember when I said I had more Gamesnostalgia mentions to come, well here's the next one, the Amiga's answer to Street Fighter, ' Body Blows ' by Team 17 way back in 1993. This was according to many Amiga game mags of the time, one of the best beat em ups money can buy, a true corker and one such mag The One even said "If you thought Streetfighter II was the business, think again" . A game worthy to be on the Amiga indeed, released for both AGA and non AGA models and much better than the PC port version, hence mentioning this one instead! 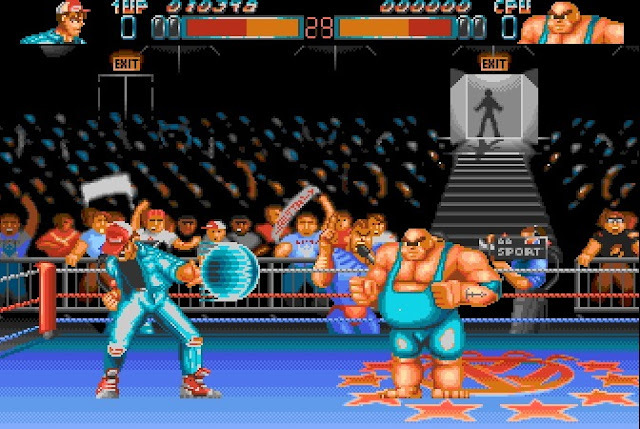 Body Blows has a 2 player mode and players can choose between 11 characters. Designed specifically for the Amiga with all models supported. It has 256 colour graphics, 4 channel stereo music, speech and sound effects. Fighters are controlled with one-button joysticks, with special moves triggered pressing fire and pushing in a certain direction, or holding fire for a few seconds.